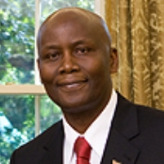 Elkanah Odembo began serving as Kenya’s Ambassador to the United States in June 2010. Odembo earned his Bachelor’s degree in Biology and Sociology at Bowdoin College in 1980 and was a member of the soccer team. He went on to add a Master’s degree in Public Health (Epidemiology) at the University of Texas. Odembo’s first job was Research Officer for Nairobi’s African Medical Research Foundation in its Community Health Division. He then joined the Ford Foundation as a consultant to its Coordinator of Africa Philanthropy Initiative. He subsequently served as East Africa Representative for World Neighbors. Odembo was then appointed as Chairman of the Kenya Community Development Foundation, and Lead Facilitator for the Kenya Poverty Reduction Strategy Paper Consultation Process. He also became a member of the UNDP Africa 2000 Project selection committee. Odembo was a member of the National Committee for Social Dimensions of Development, and the NGO Coordination Board of Kenya. Additionally, he was a founding member of the NGO Coalition for East Africa, a member of the National Advisory Committee for Health Research, Chairperson of the Kenya National Council for Non-Governmental Organizations (1997-1999), and Founding Director of Ufadhili Trust (Centre for Philanthropy and Social Responsibility). In January 2009, Odembo was appointed Kenya’s Ambassador to France. Odembo is a Fellow of the Africa Leadership Initiative, and a Synergos Senior Fellow. He and his wife, Aoko Midiwo-Odembo, have two children. Among the positions Midiwo-Odembo has held are planning officer for the International Centre for Insect Physiology and Ecology, contract manager for the African Medical Research Foundation, and liaison coordinator for The Carter Center in Nairobi. Her brother, Jakoyo Midiwo, is a member of parliament, and her first cousin, Raila Odinga, is the prime minister of Kenya.